March 24, 2017 / Modified mar 24, 2017 7:22 p.m.
Greenhouse technology and techniques being developed in Tucson may help make food more nutritious and produce higher yields. University of Arizona students and professors study greenhouse practices near North Campbell Avenue and East Roger Road, cultivating strawberries that can withstand Arizona's dry, hot weather, even inside a greenhouse, studying seven types of tomatoes to see which are better off inside a controlled environment, and floating greens on fertilized water to reduce soil use. Hate Crimes: In the wake of vandalism at the Islamic Center of Tucson, and bomb threats at the Tucson Jewish Community Center, the Tucson City Council approved a new hate crimes ordinance this week. The change means, in addition to state law that allows felony hate-crime prosecution, now Tucson has created misdemeanor hate crimes, said Councilwoman Karin Uhlich. Todd Rockoff, president and CEO of the Tucson Jewish Community Center, and Mahmoud Obagi of the Islamic Center of Tucson, said the community has been supportive of them after the incidents, and they worked to return to normal operations as quickly as possible. Food production: Local University of Arizona researchers are developing ways to grow more food in greenhouses. Myles Lewis, Stacy Tollefsen and Cheiri Kubota explain their work. Then, Gene Giacomelli, the director of the Controlled Environment Agriculture Center, talks about the bigger picture, what the research could mean for future food production on Earth and elsewhere. There's an event next month that will allow Tucson to taste the food and learn about the work at the CEAC. Menu and ticket information is available online. A coyote uses the wildlife overpass across State Route 77, also known as Oracle Road. Wildlife crossing: A new wildlife crossing allows animals to go over or under State Route 77 near Oro Valley. The Arizona Game and Fish Department has its first set of data showing how many animals used the crossing in its first several months, and which species prefer to go over or under the road. 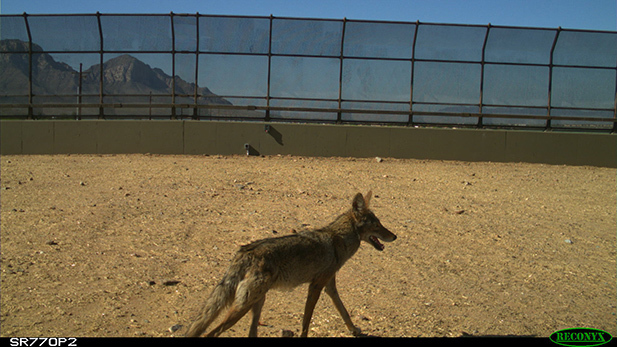 Arizona Game and Fish research biologist Jeff Gagnon said it wasn't a surprise that predatory animals prefer to go over the road, while prey prefer the protection of the underpass. Carolyn Campbell of the Coalition for Sonoran Desert Protection said the project will help inform others in Southern Arizona.